With his pinched face and right hand supporting his back, Simon of Cyrene seems to offer only grudging assistance to Christ as he carries his Cross toward Calvary. Suspended from the Savior's waist on ropes are two spike blocks, nail-studded chunks of wood that applied special torture to his bare feet and ankles. Trailing the pair are Mary and St. John, stalwart witnesses to Christ's Passion. In the border, Veronica holds the sudarium, the cloth with which she wiped Christ's face and to which he miraculously imparted his image. In the unusual second miniature, Christ quietly observes the preparation of the Cross: its crossbeam is strengthened and a hole is drilled where his feet will be nailed. A grief-stricken Mary watches from behind the hillock. 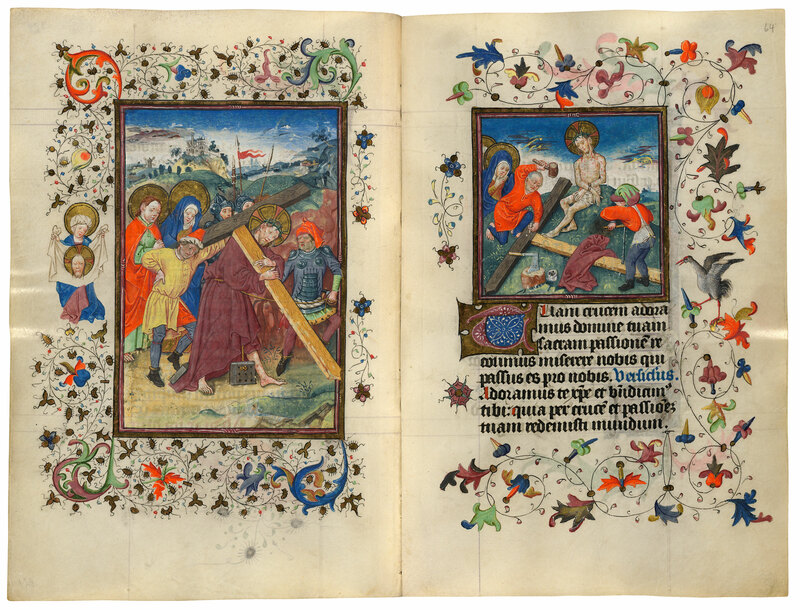 The Hours of the Passion are often found in Books of Hours following, as in Catherine's manuscript, the Hours of the Virgin. The lengthy psalms are supplemented with prayers that narrate the story of Christ's Passion. If Catherine had little time, she might pray Matins alone, where the three lessons encapsulate the entire Passion, from Christ's Arrest until his Death on the Cross. A slower meditation is provided by the remaining Hours. The drama begins at Vespers, whose prayer narrates events from Holy Thursday: the Last Super and Christ Washing the Feet of the Apostles. Compline's prayer relates Christ's Agony in the Garden. The prayer at Lauds relates to Christ Before Pilate and Peter's Denial. The Passion concludes with None's prayer telling of Christ's Death on the Cross.